BMW Motorcycles give you the mobility in traffic to get you where you need to go—fast. With irresistible design and enough comfort to rival a La-Z-Boy, BMW Motorcycles raise the bar for all other models. Now is your opportunity to feel the breeze on that morning commute. Motorcycles aren’t just a mid-life crisis purchase—they’re smart investments that expand your mobility and the scope of where you can go. The G650 has a single-cylinder, 4-stroke engine with four valves and two overhead camshafts. It has water-cooled cooling, an electronic intake pipe injection with BMW engine management, twin-spark ignition and a constant mesh, 5-speed gearbox integrated into a crankcase. The seat height is 30.7 inches and the wheelbase is 58 inches. It has telescopic fork front suspension, a rear suspension made up of a box-section steel dual wing arm, and a single disk front and rear brake. This model of BMW Motorcycles has a fuel capacity of 3.69 gallons with 1.05 gallons in reserve. This multi-purpose motorcycle is great for off-road conditions, offering decent ground clearance and a lightness that helps you gain speed. A steel skid plate offers protection on those rough rides, and hand guards protect your hands while you’re riding. Come prepared if you’re planning on a long trip—the narrow bodywork leaves the rider’s legs exposed. However, a tall windscreen helps to alleviate irritation from the wind. This newer model also comes with the familiar BMW asymmetrical headlight arrangement and the GS-style bodywork. The dashboard on BMW Motorcycles is unique in that it doesn’t have a fuel gauge, but rather a trip meter that tracks how many miles you’ve gone once you’ve hit the one-gallon reserve. The dash also has an analog tach and clean LCD screen that shows speed, dual trip meters and a clock. You can keep your eyes on the road and glance down quickly to see where you’re at. On the BMW Motorcycles website, you can purchase safety gear that will ensure you have optimal visibility and protection while riding. Adaptive xenon headlights are one of the features that can be added on to BMW Motorcycles at an extra cost. It guarantees optimal road illumination and the servo motor in the main headlight makes up for the motorcycle’s banking angle when cornering. It gives you the best angle to the road so you can see where you’re going on sharp turns. Dynamic Damping Control is a semi-active suspension system which adapts to the different road surfaces and riding maneuvers. Plus, the system monitors your spring travel, damper speed, throttle position, lean angle, brake pressure and speed. Damper valves change to match your actions, so you don’t have to. ABS stands for anti-lock braking system and comes standard in all BMW Motorcycles. It ensures the motorcycle can be controlled even during extreme braking maneuvers. Banking positions measurement is also available for extra safety. TPM (Tire Pressure Monitor) keeps an eye on your tires and ensures those long road trips are safe. With the electronic suspension adjustment function, your motorcycle’s suspension and damping matches the conditions you’re riding in. Safety clothing is also important, and BMW offers rider equipment that’s been expertly designed for your security. The clothing is developed by motorcycle specialists and tested several times for optimal construction. They utilize Armacor, a textile fabric that that has the abrasion resistance of leather and the durability to last several years. Gear is made for even the toughest contact with asphalt or gravel, composed of dual-layers at sensitive points and double seems fitted with CE protectors. On top of that, all pieces are fitted with innovative ventilation and membrane systems to make you as comfortable as possible in any weather conditions. The accessories you can get on the G650 include hand protectors, an aluminum sump guard, a high windshield and Vario cases. To ensure the safety of BMW Motorcycles, you can also perfect your riding and maneuvering on a BMW training course. These are located all around the country and have been around since the 1970’s. Qualified instructors ensure you’re 100% comfortable with your motorcycle on any type of terrain. You can choose between race track training courses (for ultimate speed) or off-road training courses that test your skills on rough terrain. These courses accommodate any skill level, and you can get rider equipment at a special rate if you’re a novice. The benefits of owning BMW Motorcycles should be weighed against the downsides. Motorcycles help you save money by offering better gas mileage than most cars and costing less to maintain and service. Plus, motorcycle insurance sometimes costs less. You can also park in tight spaces if you own a motorcycle, making it great for busy cities where parking can be a hassle. With a motorcycle, you have less space to clean and lower fuel emissions. Most importantly, you rack up fewer miles on a motorcycle than you do a car, so you can sell a used one for not much less than you paid for it. A negatives you should also consider though is that a motorcycle doesn’t always travel as well as a car on icy or wet roads. Plus, it can be uncomfortable riding in inclement weather conditions (rain, snow, extreme heat, etc.). There’s less space to store items (not great for taking out on a shopping spree) and there’s an added safety concern. You have to be a defensive driver if you choose a motorcycle. On top of that, longevity (most last 100,000 miles as opposed to a car’s 200,000 miles), the need for a helmet, and licensing requirements are also factors to consider. BMW Motorrad started out as an aircraft engine manufacturer but began manufacturing motorcycles starting in 1923. The first one was an R32 with a flat-twin boxer engine, a configuration still used today along with several other engine configurations. The production of BMW Motorcycles takes place in Berlin, Germany, with some engines manufactured in Taiwan, China and Austria. Their current models are a variety of chain, shaft and belt driven. They cover every function from off-road, dual-purpose, sport and touring. In terms of racing, BMW Motorcycles have performed well in the Dakar Rally, winning six times and featuring such riders as Charley Boorman. BMW Motorrad sticks with their core values of innovation, safety and quality in every motorcycle they produce. Their ‘make life a ride’ motto draws in many adrenaline junkies and appeals to the free spirit that calls all of us to the open road. There’s a Kansas City BMW Motorcycles club that meets monthly and has a Yahoo Group page. The site acts as a forum for club business, technical discussions about BMW Motorcycles, sharing experiences and photos and chatting about motorcycles. They also offer ride reports to help you decide which model you want to go with and what locations are best for riding. If you have any questions or technical tips, you can post on this group and receive an answer from someone in the same boat as you. It can be comforting to be a part of a community that deals with the same issues and enjoys the same experiences you do. For an entertaining read, check out these 6 things nobody tells you about owning a motorcycle. A few of them might surprise you, or convince you to finally take the plunge and make the purchase. 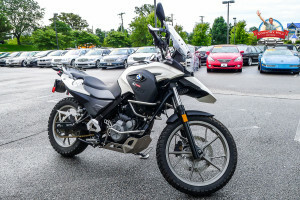 Our pre-owned 2012 BMW Motorcycle comes at a great price. Come by a Country Hill Motors location near you today and take it for a spin.